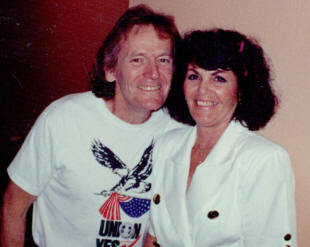 Gordon Lightfoot tells Nancy Westmoreland the story of "Carefree Highway"
Home sales across the Phoenix area continue to lag 2007 numbers. According to Arizona State University's Realty Studies department, there were 4,335 recorded home resales in March, compared with 5,385 last year. The March reading was the lowest since 1996, when there were 3,270 sales. Although numbers have been improving since the beginning of 2008 -- with 3,350 sales in January and 3,750 in February -- the year-to-date total of 11,395 is below last year's 14,190 sales. Canadian investor Trevor Matheson has taken an interest in metro Phoenix's real-estate market. So much so that he plans to buy six homes in the area over the next year. "There are definitely deals to be found in Phoenix," said Matheson, who plans to hold onto the properties for at least three to five years. Matheson is among a growing group of investors from north of the border converging on the Valley's real-estate market to take advantage of falling home prices and a weak dollar. Last year, 752 Canadian buyers purchased Valley homes, according to the real-estate data firm Information Market. That's almost double the number in 2006 and even in the boom years of 2004-05. Though Canadians account for only small part of the Valley's total housing market, their interest is growing, and that's giving home sales a boost. Through mid-March of this year, 381 buyers from Canada invested in metro Phoenix homes. Valley real-estate agents, who have seen home sales fall dramatically during the past few years, are abuzz about all the calls and visits they are getting from Canadian clients. "I am working with five different Canadian buyers now," said Diane Watson of the Scottsdale office of Realty Executives. "Many Canadians are seeing the weak dollar and what a great long-term investment Arizona real estate is going to be." Matheson purchased his first Valley home in January. Watson found him a house in north Phoenix's Kierland area that sold for $785,000 in 2006. The owners were facing foreclosure, and Matheson got it through a short sale for $470,000. Short sales let sellers avoid foreclosure, but a lender has to first agree to the price, which is less than what is owed on the home. Matheson is looking to sell six homes in Edmonton, Alberta, to buy homes here. He is selling at the peak of the market in Edmonton, where the oil industry is big and the economy is booming as a result of record-high gas prices. Canadian buyers are helping the Valley's sagging housing market, said Amy Swaney, vice president of Artisan Lending of Phoenix. But they aren't typically getting financing through local lenders because U.S. lenders have pulled back on all types of investment loans as part of the mortgage meltdown. Matheson is using a Canadian line of credit to buy his Valley properties to protect himself against fluctuations between the U.S. dollar and the Canadian dollar, known as the loonie. The loonie was worth about 70 cents to the dollar five years ago, but it's now almost equal. Last month, Canadian attorney Jeffrey Slopen took advantage of the low value of the dollar to pay $14 million in cash for a Paradise Valley estate. It's the priciest Arizona home sale to date. But some potential investors are losing out by lowballing the market. Watson was recently working with a Canadian couple who were interested in a home that had been foreclosed on in north Scottsdale, where comparables sales were in the mid-$500,000s. "This home was well-maintained and was listed in the mid $400,000s - a great buy," Watson said. "My advice was to come in with at least a $375,000 offer. However, they decided to offer $250,000." She said the couple had heard property was selling for 50 cents on the dollar in metro Phoenix. So no matter what, they weren't going to offer more than 50 percent of the asking price, she said, and the bank turned the offer down. "The buyers wound up getting back on a plane to Canada without having purchased anything," Watson said. "They could have had a great buy if they had just been realistic about the market." Existing-home sales across metropolitan Phoenix climbed last month from February's level, but it was still the slowest March for resales since 1996. Last month, 4,335 existing homes changed hands across the Valley, compared with 3,750 in February, reports the Realty Studies center at Arizona State University Polytechnic. But March is usually a robust month for sales because it kicks off the spring home-buying season. In March 2007, when the housing market had already started to slow significantly, 5,385 resales closed Valley-wide. The median existing-home price in the Valley was flat in March at $220,000. "During the last year, the housing market has been confronting issues derived from the hypermarket of previous years, such as the subprime meltdown and overly ambitious investors," said Jay Butler, director of Realty Studies. "Unfortunately, there is increasing data, such as job losses and layoffs, that the economy is now weakening and will add further stress for the housing markets." If home sales climb again this month from March's level, and home prices don't fall again, it could signal the housing market has hit bottom. Short Sale Surprises-Some Pitfalls to avoid. "Cars are backed up and down the street, what's going on?" said my wife Nancy the other day. She was sitting on open house in Carefree and noticed the traffic jam of cars slowly going by a home. "No wonder," I explained," the house there had just been reduced $780,000. The home had been listed for $ 1.6 million and suddenly dropped to $ 819,000. After going inside myself, I noticed black mold issues, ceilings falling down, there had been floods going through the house, yet on the outside, this home has remarkable curb appeal. As we go to press, the home still sits there, offered on short sale, going for less than is owed to the bank. Things aren't always what they seem. Another home has been listed in short sale on the market out here for $ 1 million dollars. But the bank really wants a bit more. Unwary consumers who are attracted to the short sale and foreclosure mania sweeping the country, need to look into these issues before they make an offer. How can a listed price for a home be less than they know it will sell for? Look at the little print you'll see in listings. . ."offers subject to bank approval." That gets them off the hook! As we approach our first 100 degree temperatures here in the desert and enter the dog days of summer, there are some incredible bargains to be had. I would look especially for homes with lots of land. 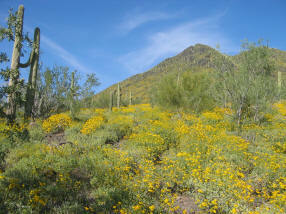 Carefree is more than half built out, Cave Creek is bordered by public lands, recreation areas and national forests. Land is king and there's less of it up there than ever.